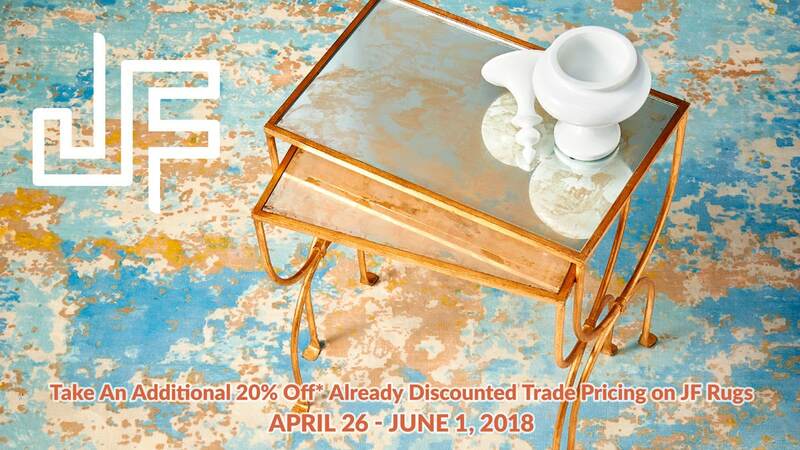 Take an additional 20% off* already discounted trade pricing on JF Rugs — April 26 - June 1, 2018. * On JF Rugs ordered April 26 - June 1, 2018. Not applicable with any pre-existing orders or other promotions. Does not apply to shipping or handling. 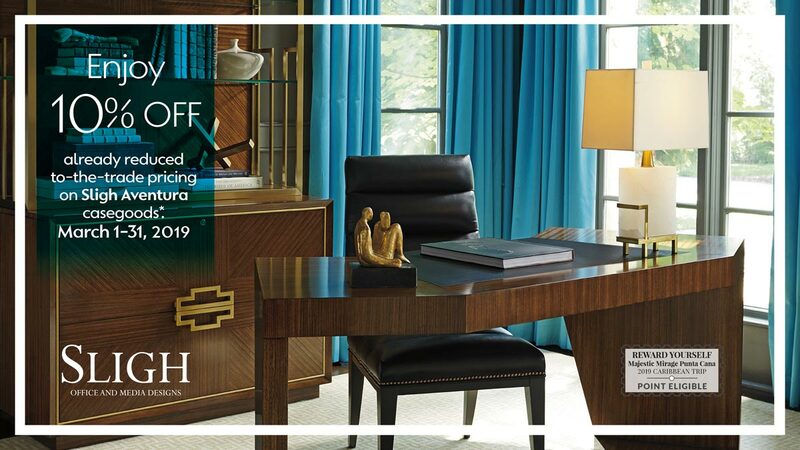 Must request discount at time of order. 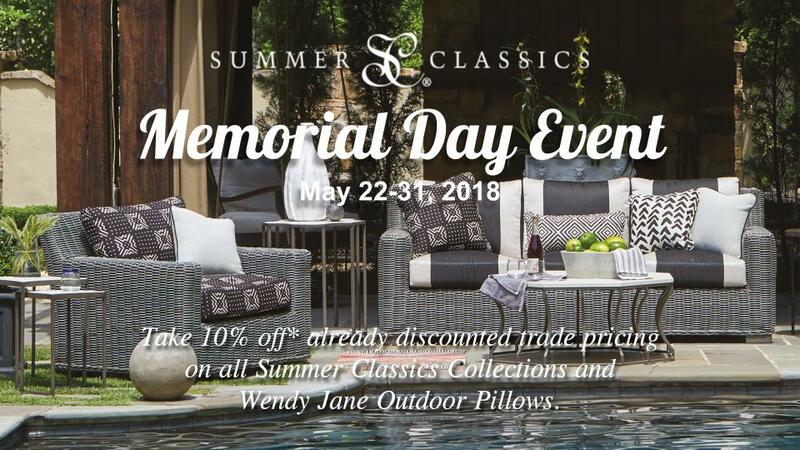 Enjoy an extra 10% off* already discounted trade pricing on all Summer Classics collections and Wendy Jane Outdoor Pillows. * On all orders placed May 22 - June 4, 2018. Not applicable with any pre-existing orders or other promotions. Does not apply to shipping or handling. Must request discount at time of order. 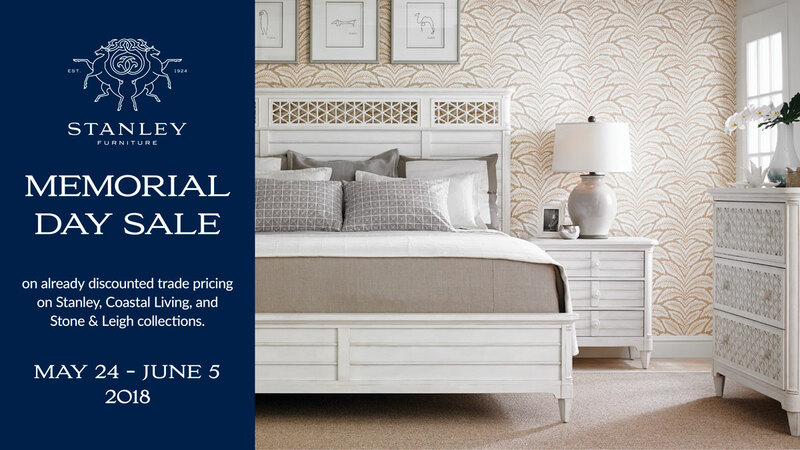 Save 20% * on already discounted trade pricing for these Stanley, Coastal Living, and Stone & Leigh collections. 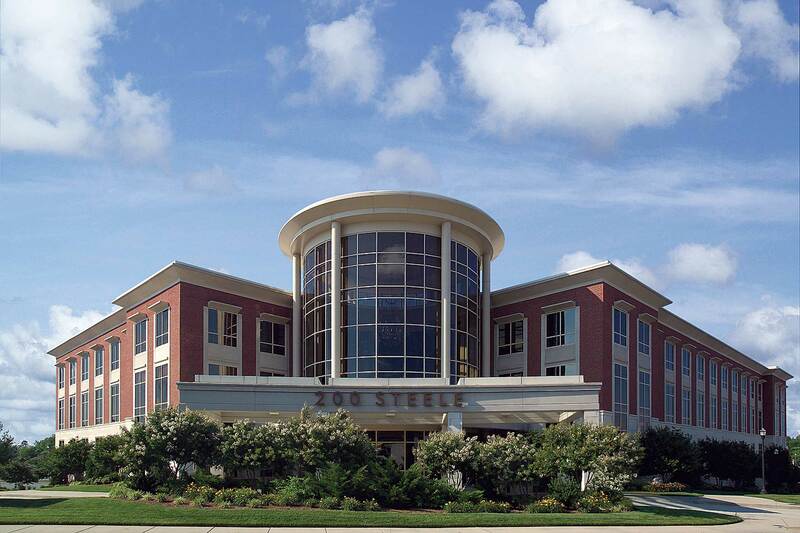 May 24 - June 5, 2018. * On orders placed May 24 – June 5, 2018. Not applicable with any sales items, pre-existing orders, or other promotions. Does not apply to shipping or handling. Must request discount at time of order. 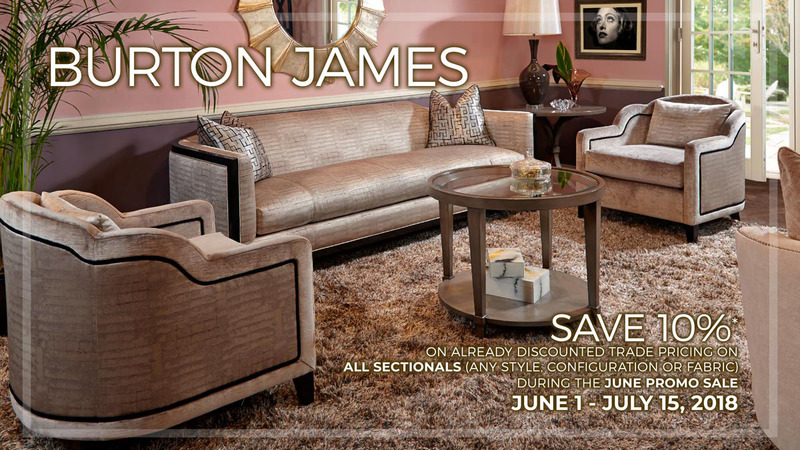 Enjoy an extra 10% off* already discounted trade pricing on Burton James sectionals (any style, configuration or fabric). 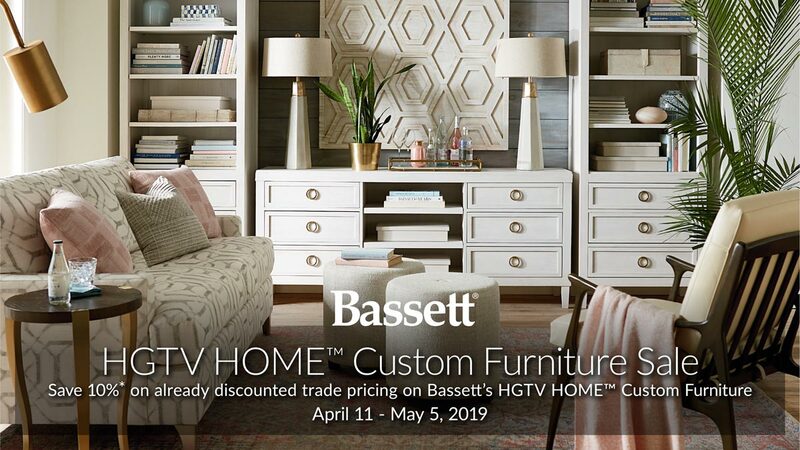 * On all Burton James sectionals ordered June 1 - July 15, 2018. Not applicable with any pre-existing orders or other promotions. Does not apply to shipping or handling. Must request discount at time of order. 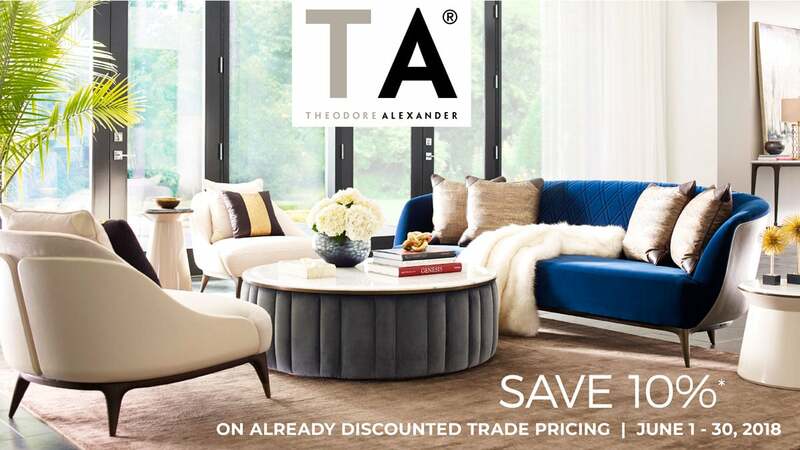 Enjoy an extra 10% off* already discounted trade pricing on the entire Theodore Alexander line. * On all Theodore Alexander products ordered June 1 - 30, 2018. Not applicable with any pre-existing orders or other promotions. Does not apply to shipping or handling. Must request discount at time of order. 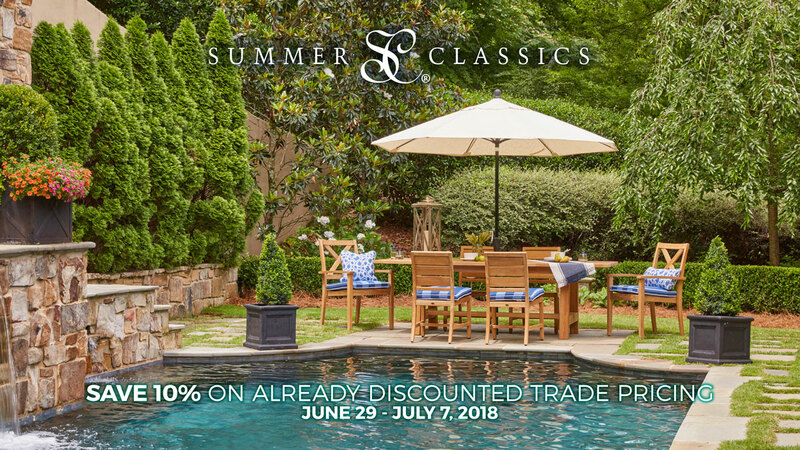 Enjoy an extra 10% off* already discounted trade pricing on all Summer Classics collections. * On all orders placed June 29 – July 7, 2018. Not applicable with any pre-existing orders or other promotions. Does not apply to shipping or handling. Must request discount at time of order.